system: Independent hydraulic system driven from the tractor PTO. systems: Long Spine Tuthill Temperley hedgehog belt with 710mm diameter fan system. The new Tuthill Model 2015 Centipede Harvester can be used with a Tuthill Centipede Side Sweep and Tuthill Front Brushes to provide a one pass harvesting system that can cover over one and a half acres per hour. No need for extra passes down your orchard row and no need to blow fruit from between the tree trunks. The Tuthill range of products are compact, efficient and economical to buy and operate. 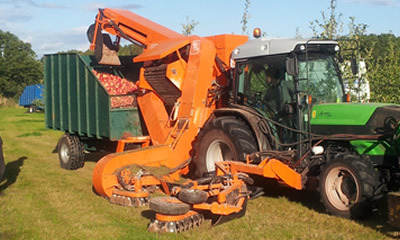 Most growers using Centipede harvesters are able to send their fruit straight to cider-makers without any post harvester cleaning. This is because the Centipede harvester has an efficient double cleaning system. It has the well proven Long Spine Tuthill hedgehog cleaner belt combined with a powerful 710mm diameter fan. This system provides very high fruit throughput with unrivalled fruit quality combined. The 2015 Model Centipede harvester has an automatic hitch with over-centre latching for towing up to 4 tonne trailers. The output of the harvester can be measured by the amount of ground it has covered or the amount of fruit harvested. In heavy crops the harvester can easily pick and clean over 15 tonnes per hour. Output will ultimately depend on the speed with which it can be supplied with empty trailers. In lighter crops the harvester can travel at up to 3 kph (2.00 mph), to cover about one and half acres per hour.